It was cold and rainy in England, and I hated it! Grey storm clouds gathered in the air high above, and chucked down the heaviest rainfall in years, it was all over the news. Just rain this, rain that. Even my family, who were usually so interesting, chatted endlessly about the mega-downpour going on outside. At first it had been fun, riding out and getting soaked to the skin, but soon it was too wet to go hacking, even, let alone cross country, putting everyone in an especially sombre mood. I just couldn't wait to get out of here, in two days it was the start of the summer holidays, and we were going to the Bahamas! Excitement had gripped me for months, and now it was so close, and all anyone could talk about was the stupid rain! "COME ON, Katie!!" My dad yelled from downstairs, it was 5:00am! You've gotta give a girl some time! But I reluctantly dragged myself out of bed, and fifteen minutes later, we were in the car on the way to the airport. I had packed all of my jodhpurs for our two week holiday, since we were staying on a horse ranch! On the plane, I watched National Velvet, my favourite film of all time, and a strange cheesy film, a sort of wanna-be of Black Beauty, afterwards I fell asleep and woke up when we were landing, finally. I walked off the plane feeling very sophisticated, dressed in high-waisted denim shorts and a baggy white t-shirt with a bay horse faintly printed on it, tucked into the shorts and high-top vans, thinking I looked at least fifteen. That was before my mum yelled to me from the foot of the stairs: "It's OK, hon! We're over here! Katie, you must have thought we left you!". And everyone looked around, expecting to see a six-year-old girl. "Mum!" I hissed when I got to the bottom "Please, don't. I'm not five!" She looked a little hurt "I was just trying to look out for you!" I felt a little guilty "Thanks, but tone it down a bit, please?" She smiled and patted my arm, we were friends again, Phew! "Hey, everyone!" Shrieked a skinny girl with honey blonde hair in bunches, wearing jodhpurs and a red tartan shirt. "I'm Honey!" A perfect name, I thought "I'll be your riding buddy for the week! If you'll follow me, I'll show you to your horses! C'mon!" The stables were gorgeous, big, old american-style barns painted black and with a red trim, and inside they were even more grand, big timber stables and hay bales piled high above. I loved it. 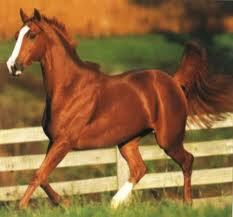 My horse was a beautiful coloured pinto, Tonto. "He's amazing, ain't he?" Honey asked. "Yeah, he's the best." I cooed, patting his neck. "You wanna go for a ride?" I nudged Tonto into a canter and we raced along the bridle path, right behind Honey, who was on her bay Quarter Horse, Red. Suddenly, Red screeched to a halt and we almost banged into them. "What is it?! "I yelled at Honey. "Sh! You'll scare him!" She hissed. "What?" I whispered "Scare what?" I'll write more if I get comments! Thanks for reading! loving it so far. post more!! i love wild horses come on. Good job please post more! Happpy summer! cool story. very interesting. hope you keep writing and good luck! I like it, it is totally horse crazy! "They're really rare, we were lucky to jus' see one," Honey said, in the process of shovelling a mountain of spaghetti into her mouth "Jus' stop obsessing!" I nodded, dejected and began to eat, but not before Mr. Jones, Honey's father interjected. "What did you see, Honey?" He asked. "No, you saw something, didn't you? Something important." "Yes!" I exclaimed "We saw the Abaco Barb!" "An Abaco Barb? You can't have! There are only five of them in the world! It was probably just a horse that escaped from somewhere, you should have brought it back here, and we could have sent it home. Really, girls." Mrs. Jones shook her head. Honey gave me a look, she obviously hadn't wanted to bring this up with her parents. "That's what we thought, mamma, but he didn't look owned. He looked... free, I guess. Yeah." I nodded vigorously. "Mm, yeah, he didn't even have tack!" "Sweetie, horses don't have to be wearing tack to escape." My mother cooed, in a rather patronising way, I thought. "I know!" I snapped. She looked down. "And you shouldn't say that, 'escape'' I spat the word out. "Don't be so rude!" My dad snarled. I had never seen him snarl before. And it was my turn to hang my head. "Well, it was nice of you to share with us, girls, why don't you go to bed?" "Okay." We nodded and went upstairs. Honey looked at me quizzically. "What?" I fumed. "Oh, nothing... It's just. Uh... Why do you talk to your mum like that. I mean, if I said something like that, well... You get the picture." "I don't know, I guess it just got like that after a while. You know?" She nodded. I was ashamed of my self. That night, I snuck out of the bedroom I was sharing with Honey and tacked up Tonto in the stable, he nudged my pockets gently and wrestled for the carrot I had stored in there. I was saving it for the Abaco Barb, but gave Tonto half, because I felt suddenly awful that I hadn't stashed something to give to him. I mounted up and we cantered off into the trees to find the wild horse. But when we got to the clearing, we didn't find what I expected, they were all there, five horses. The last five Abaco Barbs. Except for one thing, there weren't five horses, there were six, and I was dumbfounded, when one, a stunning chestnut, made his way towards me. come on you had to stop it at the most intresting part of the story..
"C'mon, boy, over here!" I clucked silently to the chestnut horse in front of me. He nickered softly in return and i grinned, we would be friends, i was sure of it. I carefully took out of my pocket a make-shift halter i had made that morning in anticipation of his moment and slipped it over his nose and ears before he could react, but nothing like the terrifying thoughts I had had happened, he stood perfectly still as I pondered over the events of my first day, and both he and Tonto were getting restless. We headed back to the farm in a state of complete bliss. I had no idea what had made me come out in the black of night on a wild goose chase to find a mystical horse, but I was glad I did. When I got back, I put Tonto out into the field where he had been before I caught him and led the Abaco Barb into an empty loose box and looked at him for a while. Too long. When I looked at the time on my phone, it was five'o'clock, already! Everyone would be getting up in two hours, and they would find a strange horse in someone's stall! I ran to find Honey, and found her asleep in bed. "Honey!" I hissed. "Ugh, what?" She said a little too loudly. I put a finger to my lips and dragged out of bed and down to the stables. "What are we doing here?" She groaned. "What. Who. When, Where... Why?" She bombarded me. So I told her the whole story, the whole time she stood gaping at me, her mouth like a huge black hole. "Wow." She breathed when I finished "Well, that's great. But the question is: what do we do now?" And that was just what I had been wondering myself. Plz do a part 4! Love your story! Please do part 4!! I have been waiting! More please, more and more! I must know the ending now.